Thrush is a bacterial infection of the frog that is located in the horse’s hoof. You will definitely be able to recognize thrush by the foul smell and the gray-black discharge. 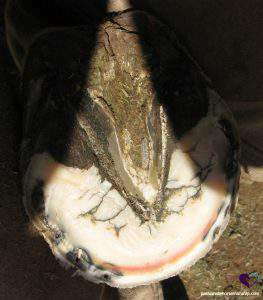 If left untreated it can cause the heels to split and bleed and cause lameness. Thrush is caused when manure or mud gets packed in the hoof and is not cleaned out on a regular basis. I’ve also seen thrush where the shoe was when it was removed. Moist, dark and dirty environments are excellent breeding grounds for bacteria. Thrush can be very painful for the horse and should not be left untreated. Thrush can also be caused by improper diet, poor hoof care, insufficient exercise and unusual hoof growth, but for the most part, it is caused from standing in wet or dirty conditions. Horses that are confined to stalls or are in an area that has standing water or mud for several days are susceptible to thrush. It’s best to keep your horse in a clean and dry area. If kept in a stall use stall mats under the bedding to help keep the stall drier. Thrush is simple to deal with if recognized and treated early. If thrush is in the advanced stage you will need to seek the services of a veterinarian and farrier. Thrush can be found in both the front and back hooves. To properly treat thrush you must first start by cleaning out the hooves daily and then apply a thrush treatment. There are several commercial products on the market for thrush that will kill the bacteria. Some of the products contain toxic chemicals so read the labels. I choose not to use products with toxic chemicals in them instead I use essential oils. Both of these essential oils Melaleuca (Tea Tree) and Thyme are antibacterial and anti-fungal which is very important. Essential oils are just as effective as the products with toxic chemicals and are safer for your horse. If you choose to use the Tea Tree essential oil make sure you get it from a reputable company like Dynamite Speciality Products. Some companies dilute the essential oil with pine oil or other things which could be very caustic or irritating to your horse. Winter is the time of year when you’ll see more thrush because of all the moisture. Prepare ahead and make sure there is a clean dry area that your horse can get to. If you suspect your horse has thrush call your farrier as they can help you determine the severity.